The Baseball Hall of Fame announced the results of voting today for its 2015 class, and former Phillies starting pitcher Pedro Martinez was one of four elected. Joining Pedro are fellow pitchers Randy Johnson and John Smoltz, and 2nd basemanCraig Biggio. Martinez played parts of 18 MLB seasons, but it wasn’t until the end that he finally donned the red pinstripes. In 2009, Pedro signed with the Phillies in mid-July in hopes of winning a final World Series crown. The Phils were the defending champs, and were leading contenders again. Pedro had sat out the first few months of that 2009 season at age 37. In 9 starts after signing, Martinez went 5-1 with a 3.63 ERA. In 44.2 innings he had a 37-8 K/BB ratio. In Game 2 of the 2009 NLCS, Pedro pitched 7 shutout innings, leaving with a 1-0 lead over the Los Angeles Dodgers. LA rallied against the bullpen to win 2-1. It would be their only win, as the Phils returned to the World Series. the New York Yankees, an old Pedro nemesis from his Red Sox days, beat the Phils in 6 games. Pedro started in Game 2 again, and again he pitched well but didn’t win. He allowed just 2 runs over 6 innings in a game the Yanks won 3-1 to even the series. That World Series game was Pedro’s final appearance on an MLB mound. He finished his career with an overall 219-100 record with a career 2.93 ERA during what was a mostly extreme offensive period. 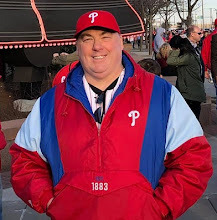 His election today will make him the 36th person with Phillies ties to be inducted into the Hall of Fame. The ceremony will take place on Sunday, July 26th in Cooperstown, New York.